Steel Dreadnought Games: Take your naval warfare to the next level with Naval Thunder: The Atlantic Campaign! Finally! A way to enjoy a naval campaign game without boring administration or complex record keeping! 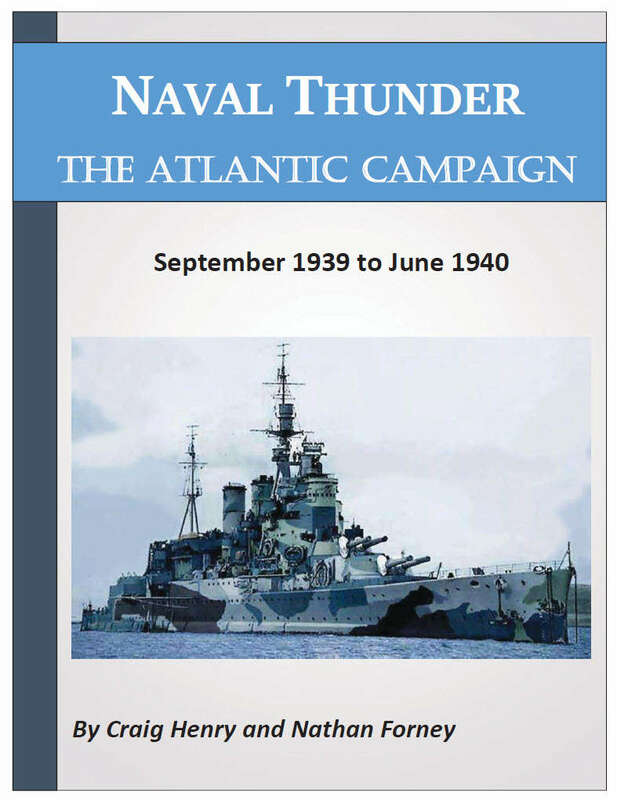 This book provides a complete set of rules for running a campaign game covering the critical early phases of the naval war in the Atlantic during World War II. The rules introduce a revolutionary chained event system where the choices and outcomes of earlier events and battles influence the events that may occur, and the options you have later. No two campaigns play out the same way, providing infinite replayability.The rules are set up to put you in control of the critical strategic choices that must be made within an ever changing environment of limited information and events that may be outside your control. But the focus stays centered on the action on the tabletop as you battle it out with your opponent! Realistic strategic concerns create historical choices for the commanders. "Should I prolong the fight to finish off these enemy ships, knowing that enemy battleships might be heading this way? Or should I play it safe, take what I've achieved and get out before they show up?" Victory conditions ensure that players must make realistic choices about trade-offs between achieving objectives and preserving your forces, just as the historical commanders had to. Fighting to the last shell is rarely the best option. Launch raiding sorties, deploy forces to counter your enemy’s plans, evade U-Boats, or strangle the enemy’s supply lines. The choices are yours! Can you anticipate your opponent, or will you be caught scraping together scratch task-forces, to counter an unexpected threat? The strategic choices are complex, but the record keeping is simple and easy thanks to the chained event system and campaign tracking guide. Also included are a slew of crunchy new rules including: 12 new data cards for ships never before seen in Naval Thunder, Sea State Effects rules, Rules for incorporating U-Boats into the campaign, Orders of Battle for the Royal Navy & her allies, as well as the German forces, And much more! Naval Thunder: The Atlantic campaign is for two or more players, and can be played with or without a referee. Naval Thunder: Battleship Row and Naval Thunder: Bitter Rivals are required for play.